Visiting the doctor is essential to a senior’s wellbeing, but many people delay going to the doctor. Seniors may avoid the doctor’s office for many reasons, ranging from denial about a health condition to a fear of medical settings. Here are a few ways to motivate a reluctant parent to see a doctor. Be careful about the way you try to motivate your loved one to visit the doctor. Going into the conversation in an agitated mood or bossing your parent around may make him or her more stubborn. Seniors are more likely to do what you suggest when you treat them with respect and love. Calmly explain that you’re concerned about your loved one’s health and would like to help him or her visit a doctor. Talk about the reasons your parent might want to avoid the doctor, and think of logical ways to alleviate those concerns. 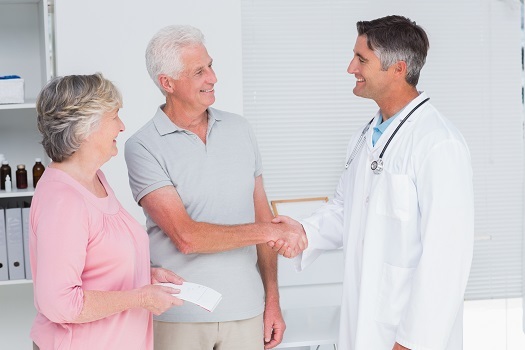 Visiting the doctor is not the only way older adults can enjoy better overall health. Seniors who want to remain healthy as they age can benefit in a variety of ways when they receive professional senior care. Portland, ME, Home Care Assistance is here to help your loved one accomplish daily tasks, prevent illness, and focus on living a healthier and more fulfilling life. If you know your loved one is particularly sensitive about a certain topic, it might be best to steer clear of it and discuss other health concerns. For example, if your parent is exhibiting signs of memory loss but hates the idea of being diagnosed with Alzheimer’s, you could suggest going to the doctor to get a routine checkup. Emphasize all the useful treatments your loved one can get to make life easier and more comfortable instead of talking about diagnosing unpleasant illnesses. Many seniors have difficulty hearing people during phone calls, finding the right doctor, and arranging for transportation to medical appointments. Your loved one may be more likely to go to the doctor if you make the process convenient. Booking an appointment with the doctor and offering transportation may make it difficult for your parent to back out. Aging adults who need help around the house, transportation to medical appointments and social events, and assistance with exercise can benefit from having an in-home caregiver. With the help of Home Care Assistance Portland, seniors can enjoy greater independence and receive regular mental and social stimulation when relying on a trusted professional who is expertly trained in various aspects of senior care. All you need to do is suggest a trip to the doctor’s office and then mention that afterward you can stop at a nearby store, café, movie theater, museum, or something else your loved one likes. The prospect of looking forward to something enjoyable after the appointment may motivate your parent to visit the doctor. In addition to regular medical checkups, many older adults require assistance with daily activities. If your aging loved one needs occasional help with bathing, grooming, cooking, or other basic household tasks, or if you need time to attend to important personal matters, reach out to Home Care Assistance, a leading provider of live-in and respite care. Portland seniors can maintain their independence while living at home with the help of our reliable respite caregivers. To learn about our high-quality in-home care plans, give us a call at (207) 835-4849 today.